If you’ve seen BBC’s Planet Earth, you may recall of one of its sillier scenes: the superb bird-of-paradise mating dance. A female hops up to a male, who unveils a mane of feathers and puts on a performance like a drunk rendition of “Bohemian Rhapsody” at a karaoke bar. But when the male bird faces the camera, things go black—way black. Skip to 2:34 in the video below. 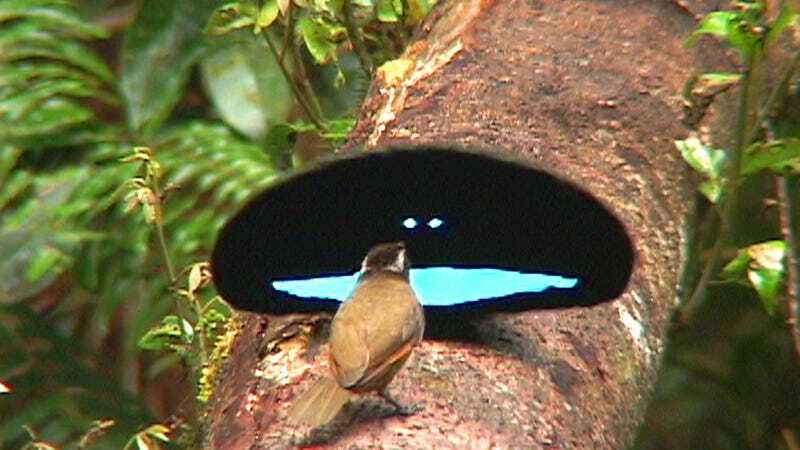 This bird’s feathers are so black that you can’t see any of its facial features, just radiant blues on a sea of natural Vantablack. The research into these black feathers began when Yale scientist Richard Prum spotted the bird in a museum and noticed the same all-encompassing blackness. It was “like a black hole on a shelf,” study author Dakota McCoy from Harvard told Gizmodo. Prum realized it couldn’t be a pigment alone. Their team thinks these birds-of-paradise evolved naturally “super black” feathers to make the colors look even brighter during the courtship dance. These microstructures demonstrate “structural absorption,” just like manmade super-black materials. “When you have no flat surfaces, the light gets completely absorbed by the feather,” said McCoy. In this case, the feathers absorb 99.95% of light shined directly at them. It appears that the need to find a mate has caused evolution to create its own super-black material, made from the protein keratin. “That makes me think that we may be able to achieve super-black structures using cheaper materials,” she said. 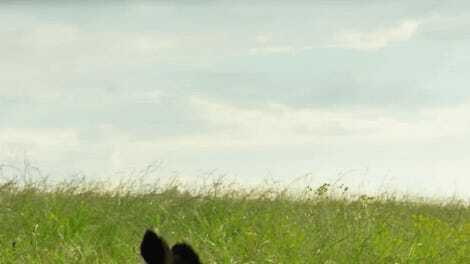 At least one scientist not involved with the research, Trevor Price from the University of Chicago, found the research “very interesting and pretty straightforward,” he said in an email to Gizmodo. He wrote that it makes sense that scattering in this way should increase absorptance. Learning more about light absorption is important for textiles or even solar panels. 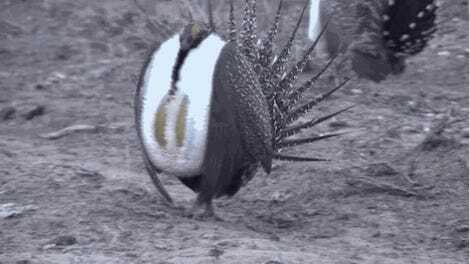 But McCoy cautioned that you wouldn’t want to line your solar panels with these feathers—you’ll notice in the video that they’re only super black when looked at head-on. More research is required to completely understand the role of these feathers to the bird’s behavior, according to the paper published today in Nature Communications. But if the team’s hypothesis is correct, then evolution has demonstrated that procreation can lead to some very peculiar appearances, especially in birds like these. “They’re perfectly evolved for their purpose: to look great for a female,” said McCoy.